No visit to Korea is complete without traipsing over to Busan, the country’s seaside second city. Unlike other Korean destinations, the charms of Busan don’t immediately jump out as you first venture into its drab urban sprawl. Spend just one day in Busan though, and I guarantee you’ll see things in a different light. Whether you’re charmed by mountain- or seaside temples or ready to soak up the rays at surprisingly pristine intercity beaches, Busan delivers in spades. The biggest problem in planning a trip comes with choosing where to stay in Busan. Like the grander Seoul, Busan spreads over a wide area. In fact, finding the perfect accommodations is perhaps even tougher than Korea’s capital when its hilly coastal geography comes into play. Disparate neighbourhoods, hemmed in by mountains or connected by bridges, don’t make for easy travel between the city’s top attractions. Many of the best things to do in Busan reach into the city’s far corners, making it all the more important to sort through the best places to stay in Busan carefully. Like in any big city, nailing down the best neighbourhoods in Busan for travellers isn’t always the easiest task. 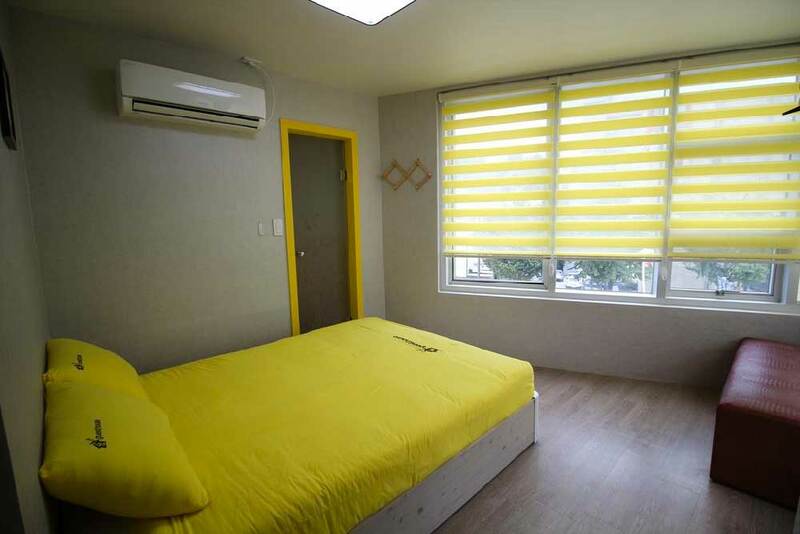 There’s a huge inventory of accommodations in Busan at various price points, but not all are great for travellers spending limited time in the city. To get the most out of your travel experience, you’ll want to stay in a central location that’s easily accessible via Busan’s public transportation system. Unfortunately, there’s no easy win here. Unlike in Seoul, walking between the top tourist sites in Busan isn’t so easy. Some of the most compelling are in the fringes of the city, meaning you’ll need to come to grips with the excellent subway or bus system to get where you need to go. Each of the areas features excellent public transportations connections to the rest of the city with more than enough within walking distance to keep you satisfied should you want to explore around your hotel. Let’s take a look at each, shall we? Occupying the top spot among the best places to stay in Busan, the bustling neighbourhood of Seomyeon is about as central as you can get in this sprawling and geographically-complicated city. The main reason most travellers will love staying in Seomyeon is that it lies at the intersection of Busan’s two main subway lines, Lines 1 & 2. From either of these lines, you can zip over to most of the best attractions in Busan without having to change trains including Beomeosa Temple, Haeundae Beach, Jagalchi Market and Gwangalli Beach. In a city with such grand distances to cover, this is definitely a huge time saver! Besides its convenient transport connections, Seomyeon offers a ton of its own charms. It’s home to some of the city’s best shopping, restaurants, and nightlife. 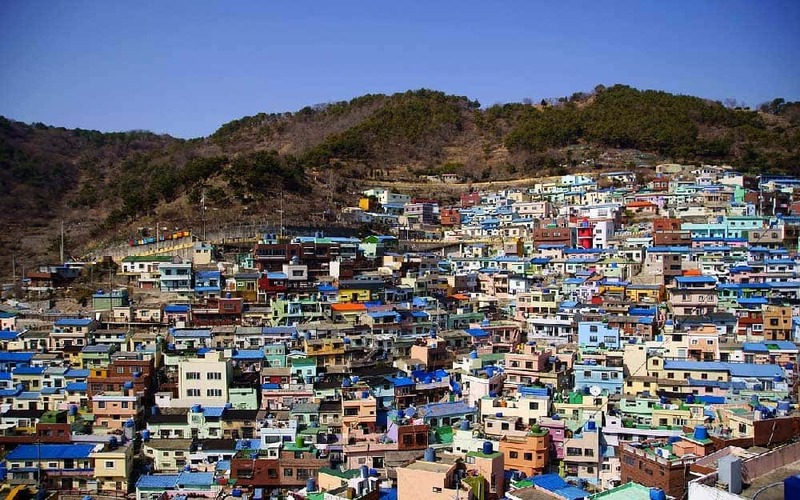 Boredom will never set in if you choose Seomyeon as your temporary home in Busan. Seomyeon is the best place to stay in Busan for most travellers, especially if you’re looking to experience a vibrant urban neighbourhood with plenty to do during the day and at night. 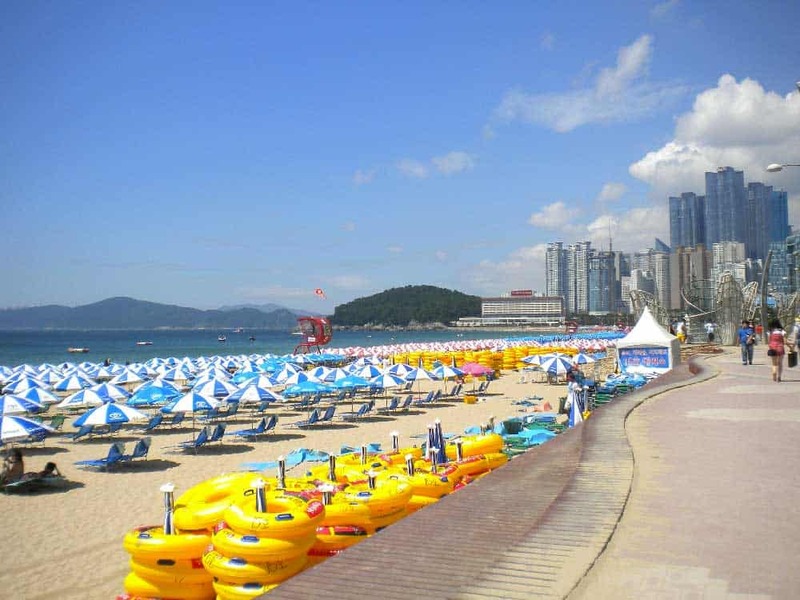 Beachgoers may want to look elsewhere, however, as Seomyeon is a relatively long subway ride away from the two best beaches in Busan, Haeundae Beach and Gwangalli Beach. 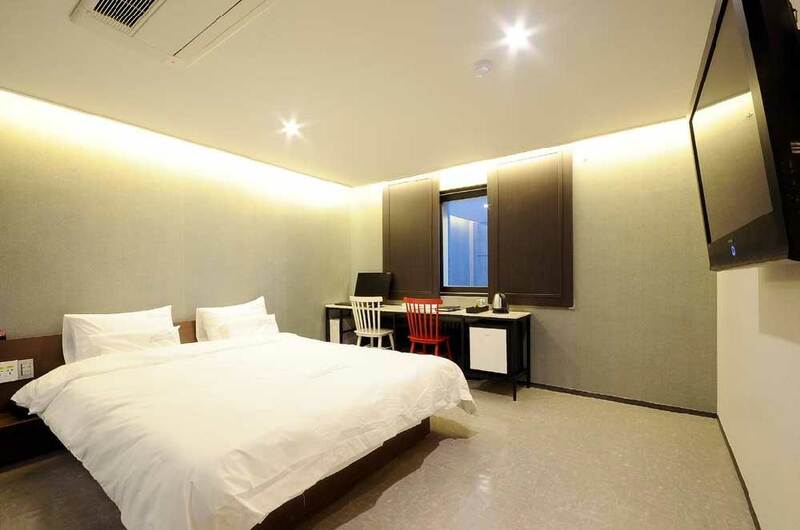 Uniqstay Bed & Breakfast: A boutique-style hotel showing off excellent value for Seomyeon. Rooms are clean, spacious & simply decorated, and include a yummy breakfast in your reservation. Seomyeon Station is just a few minutes away by foot. Arban Hotel: A delightful contemporary 3-star hotel in a super central location featuring bright & spacious rooms with sleek modern amenities. Chill out on the relaxing rooftop terrace to big views over the city. Seomyeon Station is a short 5-minute walk away to get movin’ around the city. 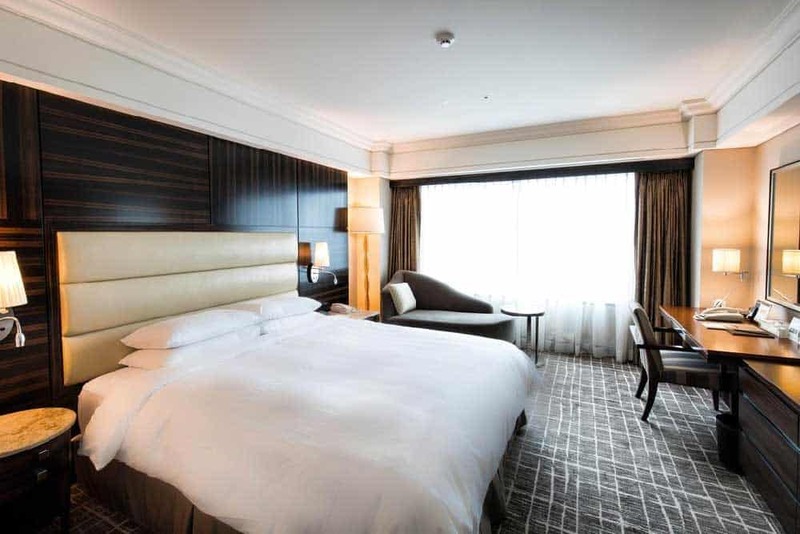 Lotte Hotel Busan: The only 5-star luxury hotel in Seomyeon. Rooms are bigger than most in Busan and feature hip contemporary styling accented by flashy city views through wide picture windows. On-site bonuses like the outdoor pool, sauna, and gym add even more comfort and convenience to your stay. The duty-free Lotte Department Store is interconnected to the hotel, making this the perfect destination for shopaholics. If the seaside charms of Busan are what lured you to Korea’s second city, the coastal neighbourhood of Haeundae should be at the top of your list of where to stay in Busan. Home to the popular Haeundae Beach, probably the best urban beach in all of Korea, Haeundae puts its waterfront glamour front-and-centre to draw visitors from all around Korea and the world. In addition to its white-sand beach, Haeundae is peppered with coffee shops, boutiques, restaurants, and pumpin’ bars. With its picture perfect seaviews making for some prime real estate, the area’s become quite fashionable. Among the glamorous buildings lining the coast, you’ll find some of the top 5-star hotels in Busan. There’s also a good selection of budget & mid-range offerings for the more price-conscious traveller. Haeundae is the best place to stay in Busan for travellers looking to get close to the beach or anyone looking for the most luxurious digs in the city. There’s plenty to do around Haeundae, day & night, so even though you’re a little far removed from the centre of the city, you won’t likely feel like it. Travellers more interested in getting an urban buzz than chillin’ on the beach would be better served in either Seomyeon or Nampo-dong. Good Day Mate: A comfortable hostel & guesthouse located just 3 minutes from the beach. Style blends shab-chic with industrial elements for a wholly unique look. Both shared accommodations and private rooms with private bathrooms are offered. 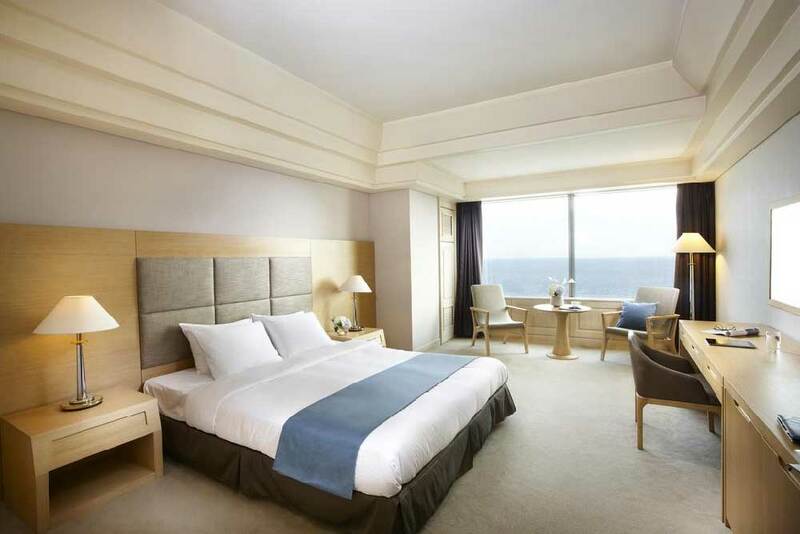 MS Hotel Haeundae: A 3-star hotel with a near perfect location in Haeundae, just a one-minute walk from the beach. Rooms are spacious and decked out with modern furnishings that create clean design lines. Beachfront vistas from the deluxe ocean-view rooms are simply fantastic. Park Hyatt Busan: Not just one of the best luxury hotels in Busan, but among the best in Korea. The luxuriant rooms are expansive and fitted with warm modern wooden furnishings for a ultra-sophisticated look. 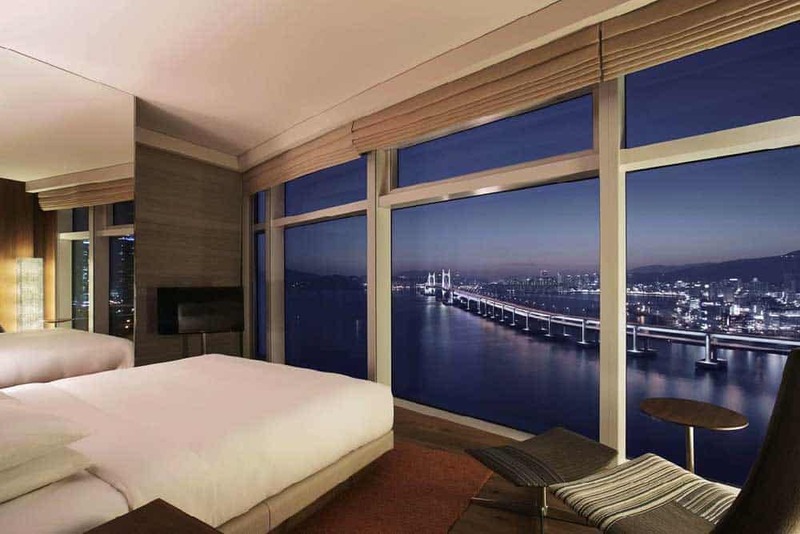 Evening views unto Gwangan Bridge from the deluxe ocean-view guest rooms and the on-site 32nd-floor restaurant, Dining Room, are magical. Feeling the Korean urban buzz in Busan doesn’t get better than in Nampo-dong, the city’s echo to Seoul’s Myeongdong. In Nampo-dong, both your tastebuds and wallet will get some exercise as some of the best food & shopping in Busan unfolds before you. What makes staying in Nampo-dong so appealing for travellers is that it’s closer to more of top attractions than any other area. 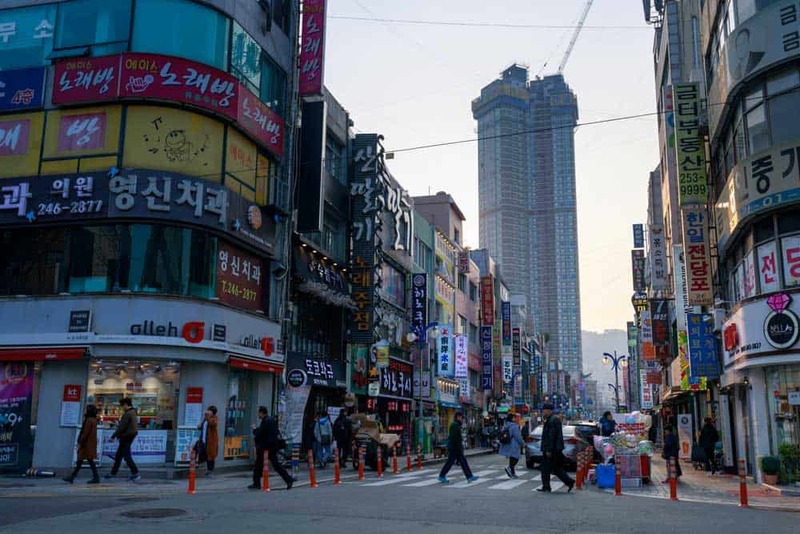 Besides its own glitzy fashion boutiques, cosmetic shops, and restaurants, Nampo-dong is just a short hike to Jagalchi Market, Gukje Market, Yongdusan Park, and Busan Tower. The colourful and artistic Gamcheon Culture Village is a quick bus ride away as well. Nampo-dong is the best choice for where to stay in Busan for travellers interested in shopping and sampling some of the best street food in Busan. It’s also great for anyone with limited time in the city since there are a ton of things to see & do within a short walking distance. If you’re more interested in nightlife than shopping & eating, you might prefer to stay in Seomyeon, Haeundae or Gwangan over Nampo-dong. 24 Guesthouse Nampo: An excellent value central property from a well-known Korean budget chain. The style here is festive and sober with bright rooms to lighten up your day. Both shared dorms and budget-friendly private rooms with private bathrooms are offered. Nampo Station is just outside the door. Stanford Inn Busan: A clean and modern 3-star hotel in an awesome location just minutes from Jagalchi Market. 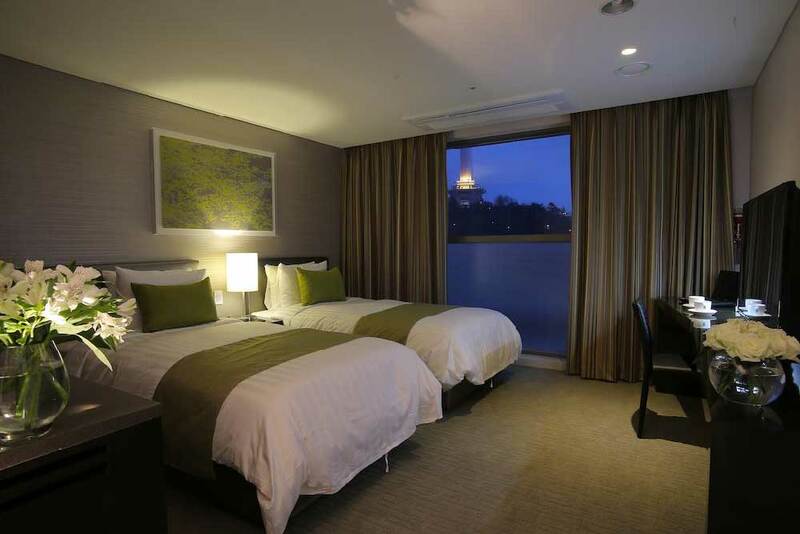 Rooms are spacious by Korean standards and showcase superb city and sea views. Aventree Hotel Busan: In the luxury-starved Nampo accommodations scene, this 3.5-star hotel is as good as it gets. Elegant rooms decorated in warm colours relax the mind as you stare out unto incredible city views. Gukje Market is right outside the door for energy-surging shopping and Korean food excursions. Sea and sun worshippers alike will love the surf & sand of Gwangan, Busan’s second most popular beach area next to Haeundae. In many ways Gwangan—with its beautiful Gwangalli Beach—is preferable to the most far-reaching Haeundae for its location closer to the city centre and its more mature evening festivities. Like other areas in Busan for travellers, Gwangan shines with its food & drink options. There are plenty of restaurants serving both Korean and international fare to keep your tastebuds a-buzzin’. The true pleasure of staying in Gwangan though comes at night. 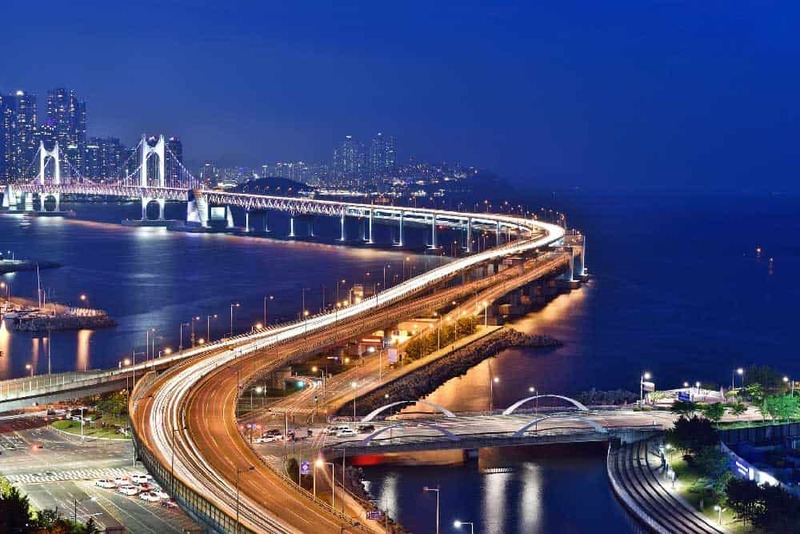 The city’s most famous bridge, Gwangandaegyo (Diamond Bridge), stretches across here, spanning the ocean over 7 kilometres over to Haeundae. Sitting with a drink to the faint evening glow of traffic racing across the lit-up bridge is one of the best experiences in the city. Gwangan is the perfect place to stay for travellers looking to spend some time on the beach without getting too far removed from the rest of the city. The slightly more urban feel of Gwangan compared to Haeundae appeals to those looking to delve into a little more authentic Korean city experience. If you’re interested in the city atmosphere without the beach or a more central location, Seomyeon or Nampo-dong would be better choices than Gwangan. 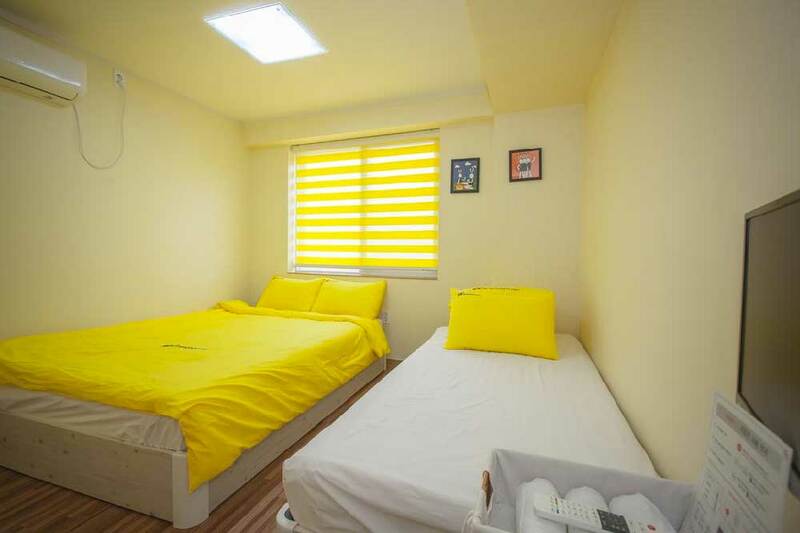 Bexco Hostel B&B: A small guesthouse delivering excellent value for accommodations in Gwangan. The excellent sea & bridge views fly well beyond the hostel’s price point. Both shared accommodations and private rooms with private bathrooms are offered. Dawn Beach Hotel Busan: A no-frills hotel located just two minutes from Gwangalli Beach. Rooms are relatively spacious for Korea and serve up amazing city & sea views. 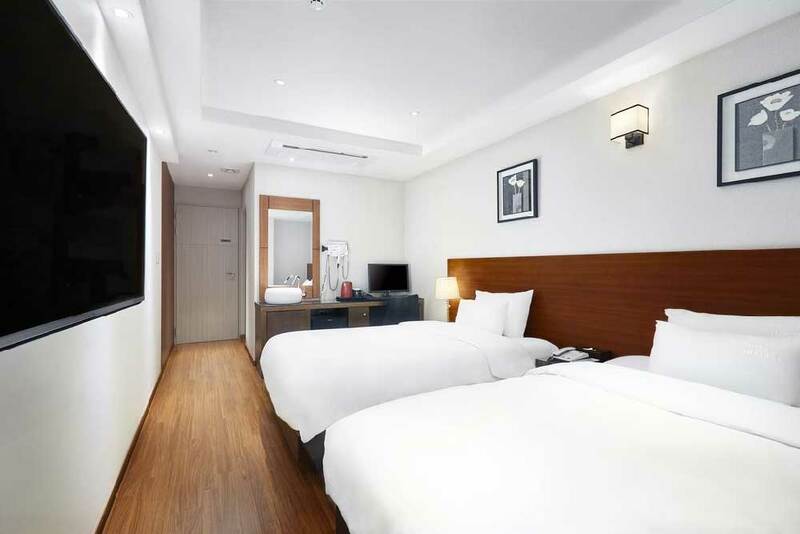 Kent Hotel Gwangalli by Kensington: Located directly on the beach, this 3.5 star property is quite possibly the best hotel in Gwangan. Each room is decorated with hip modern stylings with some featuring stunning ocean and city panoramas through wide picture windows. Getting front-and-centre in Busan is never easier than staying at the delightful 24 Guesthouse Nampo Station. Whimsical cartoon rabbits and cheery colours greet you as you enter into this clean and bright guesthouse and hostel. Both the shared accommodations and private rooms (with private bathrooms) at 24 Guesthouse Nampo Station provide cozy quarters for your adventures. The true star of the guesthouse though is the Sky Lounge, the guesthouse’s rooftop terrace. Retire here in the evening to chat with other guests amid the sights & sounds of Busan. Of course, the location of 24 Guesthouse Nampo Station is brilliant, too. As you’d guess from the name, Nampo Station is just steps away along with BIFF Square and Jagalchi Market. Experiencing Busan on a budget without skimping on quality isn’t hard when you book a stay at the Lion Hotel. For its central location in Seomyeon, this 3-star hotel is surprisingly easy on the wallet, saving you some serious won for all the brilliant shopping & eating options surrounding you. The rooms at Lion Hotel are decorated with a touch of simple modern elegance that’s far grander than its price point would suggest. 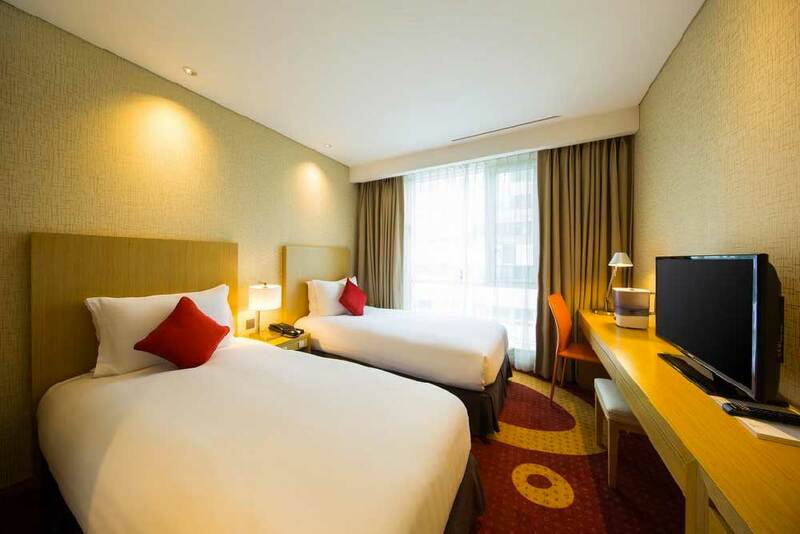 Even the hotel’s budget-friendly standard rooms are super spacious and throw in luxurious extras like large soaker bathtubs and rain showers for a relaxing stay in the heart of the city. Proof that simple doesn’t have to mean cramped or boring, Queens Hotel is one of the best choices for staying in central Busan on a budget. Rooms here defy the usual budget Korean size standard, doling out a ton of space to keep the claustrophobics among us in check. Comfortable beds at Queens Hotel complement the soundproofed rooms to deliver on a restful night’s sleep. Modern fixtures in the bathroom include deep soaker tubs and rain showers that take your comfort and relaxation to the next level. Perhaps best of all is its location. Queens Hotel chills out in the buzzing Seomyeon neighbourhood where some of the finest shopping and best food in Busan awaits. Another entry from one of the most popular budget chains in Korea, 24 Guesthouse Haeundae Premier delivers the usual goods in a location that’s anything but ordinary. Within less than a 10-minute walk from this budget guesthouse, you’ll be soakin’ up the rays and watching the surf on Haeundae Beach, one of the best places to hang out in Busan. The rooms at 24 Guesthouse Haeundae Premier, both shared & private, set the stage for relaxation with bright calming colours and clean modern decor. There’s a small kitchen for guests to cook, but with all the brilliant budget-friendly food options in Haeundae, you’d be hard-pressed to not find the meal when you walk out the door and explore. 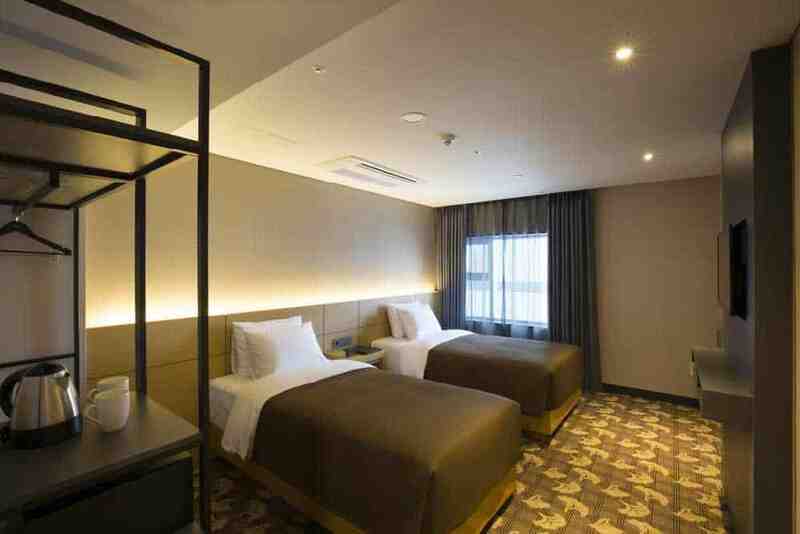 Straddling the top-end of the budget category and the low-end of the mid-range, Hotel Foret Premier Nampo assembles a classier Busan accommodations experience than other hotels at a similar price point. This elegant 3-star hotel ditches run-of-the-mill bland room designs, delighting with rich accents and uniquely patterned carpets. 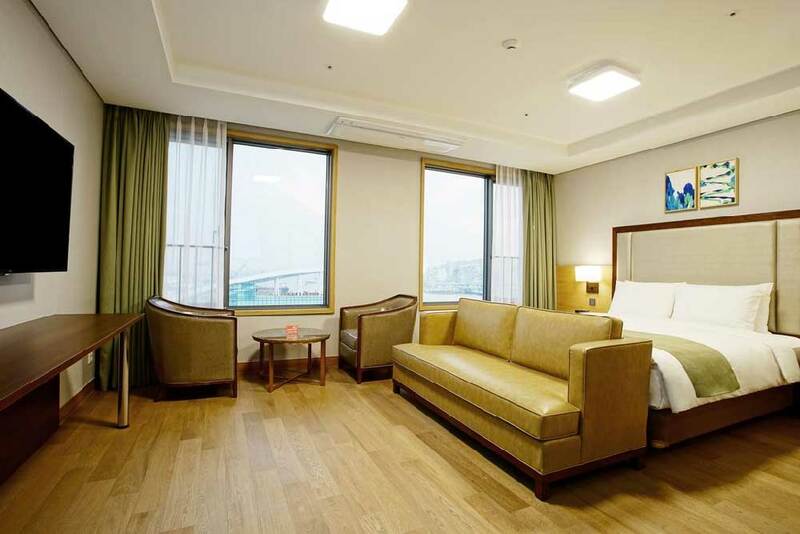 Besides the spacious rooms and expansive bathrooms fitted with modern fixtures, Hotel Foret Premier Nampo deserves kudos for its location in the centre of Nampo-dong. In whichever direction you turn, your tastebuds will have a field day sampling some of the best food that Busan has to offer or your wallet will be tempting you to dispense with some won with some of the best shopping in the city. There’s hardly a better choice among the best mid-range hotels in Busan than Stanford Inn Busan. This immaculately clean 3-star hotel punches well above its weight, charming visitors with dramatic sea and city views from its well-appointed rooms. The rooms at Stanford Inn stay true to the Anglo-Saxon name, drawing inspiration from modern and classic European designs for a look that’s unique in Nampo. Extras like deep soaker tubs and electronic washlet toilets up the value proposition finely. Even if the rooms don’t get your goat, the location will. Stanford Inn lies just blocks away from some of the top sites in Nampo-dong including Jagalchi Market where you can tackle your undying love of seafood one squid and a time (or just get your cultural fill). A fantastic central location is just the tip of the iceberg when it comes to the wonderful Arban Hotel. This 3-star gem, occupying a prime location in Seomyeon, snags guests with luxurious touches that are rare in the Busan mid-range. As much as the ample modern rooms will strike you, the appeal of the Arban Hotel doesn’t end with its interior. After a meal in the hotel’s lovely eating area, spill onto the atmospheric rooftop terrace for a bout of relaxation. Fringed by gnarled trees, flowering shrubs, and breathtaking views of Busan, this calming space will breathe life into your stay and keep you coming back for more. Droppin’ down some serious mid-range luxury in Nampo-dong, the elegant & sophisticated Aventree Hotel Busan supplies more than enough ammo to establish it as your home-away-from-home in Korea’s second biggest city. The classy rooms at Aventree Hotel are warm rather than bright, featuring rich modern accents doused in rich dark colours. There’s plenty of space, too. You’ll love chilling out in the comfortable beds here without feeling as cramped as in your standard Korean hotel room. What you’ll dig most of all though is the location. Aventree Hotel empties into Gukje Market where a treasure trove of unique finds awaits. Other shopping options like Gwangbok Fashion Street and BIFF Square are nearby while the mouth-watering restaurants of Nampo-dong are scattered in every direction. Flexing its muscles with a unique brand of mid-range glitz & glamour, the GnB Hotel delivers a superb accommodations experience that’s among the most value-laden in its category. Spacious rooms open up to stunning city views, glowing through large picture windows, that only get better as night falls. Even if the skyline vistas fails to impress, GnB Hotel’s excellent Nampo-dong will draw your attention back to it. The hotel is just 8 minutes by foot from Toesong Station where you can catch a bus to Gamcheon Culture Village, one of Busan’s raddest places to check out. The city’s best markets including Gukje Market and Jagalchi Market are similarly close to skedaddle to. 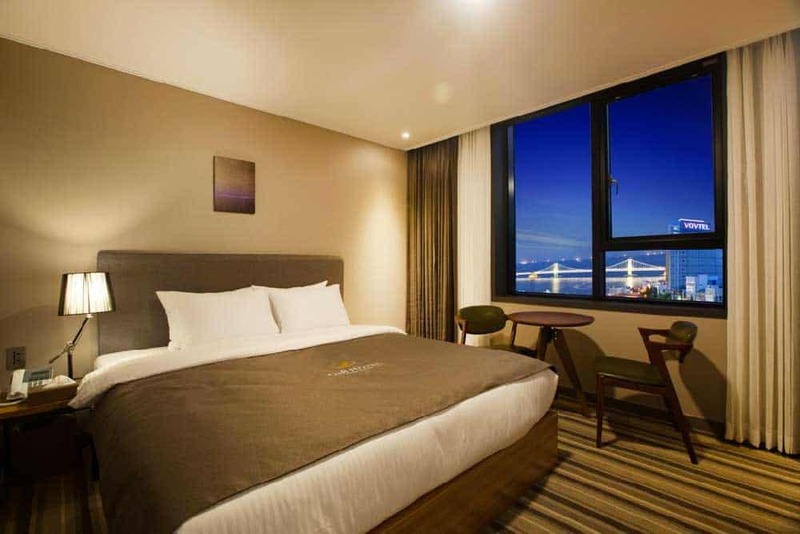 As much as Koreans might not dig it, the mighty tentacles of a big Japanese hotel chain landing in Korea can’t be too bad, especially when top-notch mid-range hotels like the Solaria Nishitetsu Hotel Busan pop up. Like its brethren in the “homeland,” this hotel delivers a delightful accommodations experience replete with extras that are often noticeably absent among peers in its price range. Relatively standard stock for Korea, the rooms at Solaria Nishitetsu Hotel are only half the picture. All guests are granted complimentary access to the sauna and fitness centre. To delve further into your wellness, an on-site massage parlour lies in wait to smush out all your kinks. No serious discussion about the best luxury hotels in Busan takes place without the Park Hyatt Busan taking centre stage. Words consistently fail to describe the allure of this incredible 5-star hotel, not just one of the top picks in the city, but in all of Korea. Rooms at the Park Hyatt charm guests with their warm wood grain flooring and contemporary furnishings blending both Asian and Western sensibilities. Floor-to-ceiling windows unleash epic vistas of the Busan skyline and the ocean with select rooms flashing the landmark Gwangan Bridge. Beyond falling asleep to the gentle lights of Busan on your cloud-like bed, the Park Hyatt delivers the full 5-star experience at every turn. Whether you’re craving relaxation at Lumi Spa & Fitness or a delectable Korean meal among the city’s best sea views at one of hotel’s two sky-high restaurants (Dining Room & Living Room), the Park Hyatt Busan will entrance and delight at every opportunity. 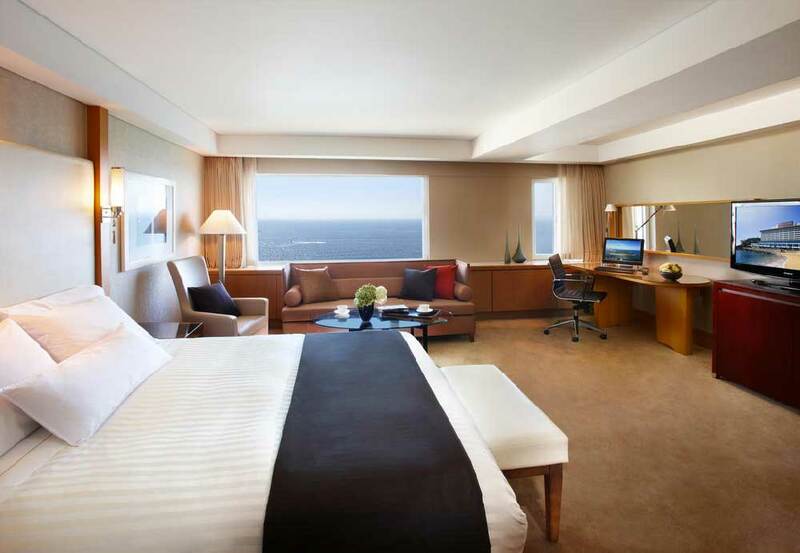 Korea’s own homegrown luxury chain hit another home run with the graceful indulgences of Lotte Hotel Busan. It’s hardly a cliché to state that this 5-star hotel, among the best-of-the-best in Busan, truly offers everything for its guests. While the rooms—with features like dark modern furnishings and deep soaker tubs—are bound to impress, the oodles of amenities are what truly separate Lotte Hotel from the pack. Drown out your stresses with a dip in the indoor or outdoor pool, sweating out some maekju in the sauna or pumping some iron in the fitness is barely the half of it. Connected to the Lotte Hotel is a massive duty-free store featuring hundreds of luxury items, a movie theatre, and a department store—all in addition to several on-site restaurants. Of course, if all of that isn’t enough, Lotte Hotel dwells in the exciting Seomyeon area where everything from shopping to eating to nightlife awaits around every corner. Beach bums with a little change to spare will love splurging on The Westin Chosun Busan. This wonderful 5-star hotel, sprouting from Haeundae Beach at the head of leafy Dongbaek Park, delivers with one of the best locations in the city. It’s a perfect alternative to getting hemmed into the clamorous streets of central Busan. 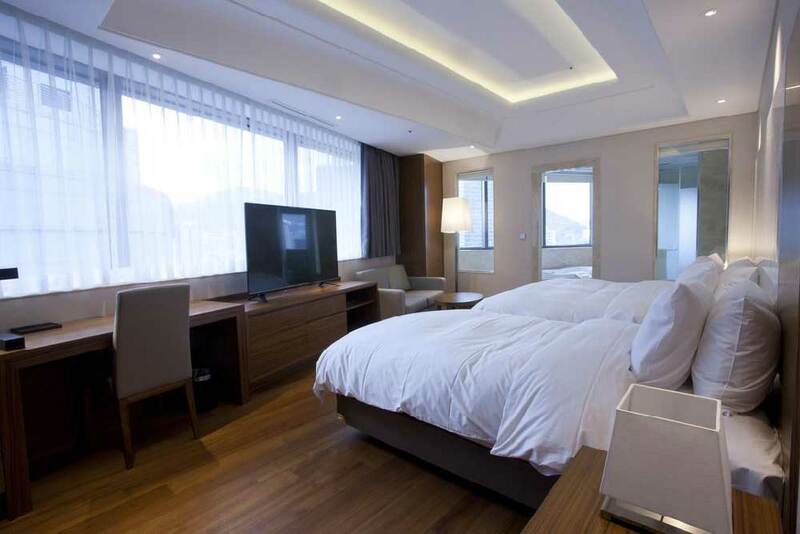 Rooms at The Westin Chosun delight with warm neutral colours for a clean and passive look. Spellbinding city & sea views through wide panoramic windows brighten by day and soften at night with the warm glow of the skyline adding ambiance. It’s the the full-house of amenities though that’ll keep you sticking around The Westin Chosun. With six on-site dining & drinking establishments—from the Korean dishes of Sheobul to the cheekily named Irish pub O’Kim’s—your tastebuds won’t leave unsatisfied. When lounging on Haeundae Beach, steps from the door, isn’t enough, unwind with a soothing massage at the on-site spa or slip into the indoor pool for a less-crowded dip. It’s easy to forget you’re in Korea’s second biggest city while chillaxing to the crashing waves at the striking Paradise Hotel & Casino Busan. From the moment you start exploring its grounds, this luxurious 5-star hotel will win you over with its broad seaside vistas set within garden-like surroundings. 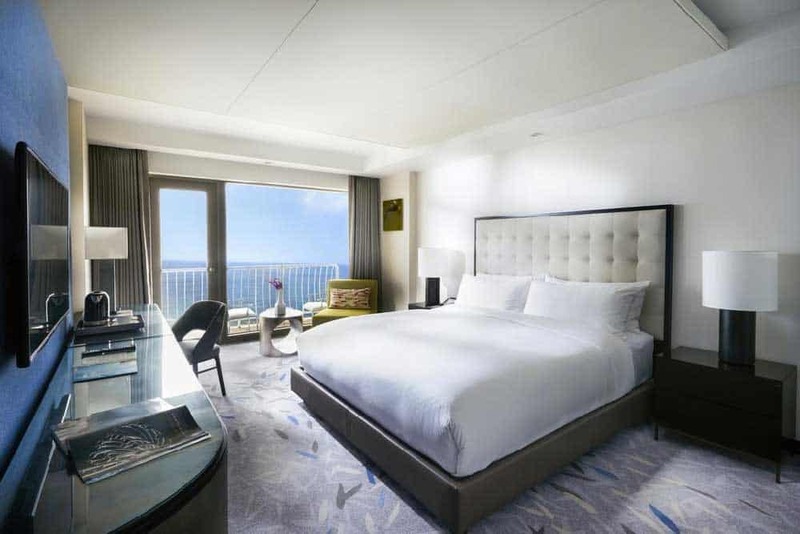 Whether you opt for a waterfront suite or a city-view twin, the rooms at the Paradise Hotel & Casino feature a refined decor that adds an air of sophistication to your stay in Busan. Where this hotel truly pushes ahead though is in its outdoor spaces. Slip into one of the oceanfront outdoor pools to soak in some of Busan’s most compelling sea views. Even if it’s a tad less flashy than the other candidates for best luxury hotels in Busan, Haeundae Grand Hotel is no slouch when it comes to charming guests. The classy rooms, festooned with sensational city & sea views, pony up some of the best value in the area—even dipping into the mid-range when deals start popping up. When Haeundae Beach, just 2 minutes away by foot, isn’t enough to get the blood flowing, Haeundae Grand Hotel offers an on-site sauna and massage parlour for guests. Travellers seeking more active pursuits will get their fix at the hotel’s indoor golf range, the drawn-out 50-metre-long swimming pool or the massive & well-equipped two-floor fitness centre. Seeking a central hotel on a budget? The modern and elegant rooms at Lion Hotel in the buzzing Seomyeon area charm without breaking the bank. Or, if you’re willing to trade space to save a few bucks, the 24 Guesthouse Nampo Station features both dorms & cozy private rooms in attraction-rich Nampo-dong. Got a little more to spend on a mid-range hotel? The Stanford Inn Busan, set in bustling Nampo-dong, fires up epic sea & city views from its value-laden rooms better than any hotel in the price range. For a similarly compelling mid-range choice in Seomyeon, opt for the lovely Arban Hotel. Ready to splurge on the ultimate in Busan luxury? Nothing compares to the graceful Park Hyatt Busan. Set upon Haeundae Beach and featuring incredible views to Gwangan Bridge, this 5-star hotel checks all the boxes when craving the quintessential Asian luxury hotel experience.